During the millionaire mindset intensive seminar, they taught about how to manage your money as well. Wealthy people aren't any smarter, they just have better money management habits. Poor people always complaint that they have no money, so no need to manage money. It's wrong because you become rich by manage your money, not manage your money when you're rich. The first account is necessities, you use this account to pay your rental, daily expanses, food, insurance and transport etc. This account contributed maximum 55% of your income. If you cannot meet 55%, try to simplify your lifestyle. Wealthy people think long term while poor people think short term. Sacrifice a bit now to grow your trees and enjoy the fruit in later stage. The second account is Financial Freedom Account. This idea of this is to create your golden goose in order for it to generate golden egg for you to spend in later stage. Remember the ultimate goal is to become financial free when your passive income able to overcome your expanses. When you stop working, you get to spend the eggs but never the goose. This contributed 10% of your total income. Third account is account for long term savings for spending. This account helps you to save for one time off spending like marriage, house down payment, car, etc. This account contributed 10% of your income. Fourth account is for your education purpose which contributed 10% of your total income too. They kept emphasize the important of education no matter how old are you. You stop growing when you stop learning. And the moment your stop growing, you're dying. Education is important no matter whether in financial field, money management, health nor in science. Ben Franklin once said that If you think education is expensive, try ignorance. The fifth account is Play!! Time for relax. Play without guilt. Take time to enjoy while striking toward your goal. This account contributed 10% of your total income. And the last account is Give which contributed 5% of your total income. Give back to the society. Remember there is always someone having a situation worse than you no matter how bad the situation you are having with. Be blessed. You will understand and remember what your goal is when you have the willingness to give. I did my part and separated my expenses from my total income into few sections and summarized it as above photo. 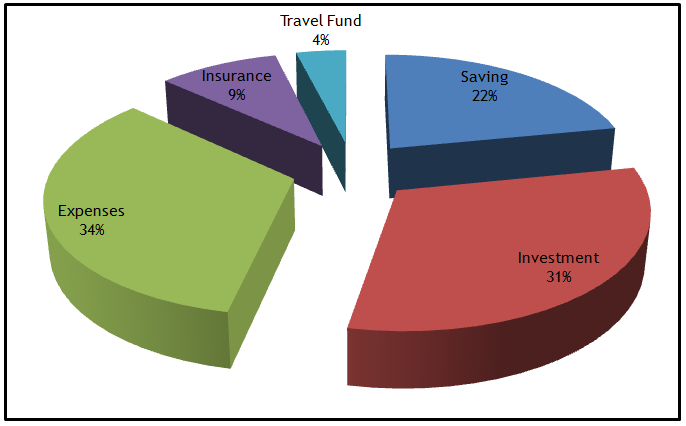 I spare an exact amount for my travel every months and it takes around 4% of my total income which still lower than the 10% "Play" account. Besides that, I have an insurance plan and a saving plan which total contributed 9% of my income. Insurance is for my protection and saving plan is just an alternative retirement plan as I do not contribute any income into CPF or EPF account while working in Singapore here. I able to keep my expenses at around 35% and if add on with the insurance premium, it will be a total 45% of my income, still slightly lower than the 55% benchmark taught in the seminar. The rest will goes to investment and saving account. I do not own any property right now as I still haven't make up my mind where to settle down. In addition, being working in Singapore, it's kinda hard for me to look for property for investment in Malaysia since it will involve a lot of travel. So, I believe my current situation is to maximize my return through equity investment rather than through property. Once my saving reach a certain amount, I will distributed more into investment section. I do not donate currently. I always think to do that but it's always still down to thinking with no action being taken. I need to further look into this. Besides, I do not spare any amount monthly for my self education purpose. All this while, the seminar, online course and books I bought were all from my savings section. I probably will keep continue doing in this way rather than spare 10% for it monthly. Lastly, I strongly believe a good money management is essential. There is countless reading material stating that by keep track of your spending, having a comfortable debt/income level, future planning and ways to improve your situation will help you to manage your money very well. You will know where your money goes to and what is the progress in moving towards your goal/target. So, did you do yours?